Abu Dhabi, United Arab Emirates – Etihad Airways, the national airline of the UAE, has announced it will be offering free golf bag luggage on its flights to Abu Dhabi with immediate effect. 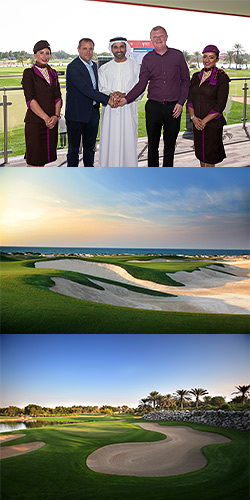 To view Abu Dhabi’s up to date Golf Destination Video, please click here. Headquartered in Scottsdale, Ariz., Troon is the world’s largest golf management company providing services at more than 430 locations around the globe, including managing 470 18-hole equivalent golf courses. In addition to golf, Troon specializes in homeowner association management, private residence clubs, estate management and associated hospitality venues. Troon’s award-winning food and beverage division operates and manages more than 150 restaurants located at golf resorts, private clubs, daily fee golf courses and recreational facilities. With properties located in 45 states and 33 countries, divisions of Troon include Troon Golf, Honours Golf, Troon Privé (the private club operating division of Troon), Troon International, OB Sports, Cliff Drysdale Management and RealFood Consulting. There are currently 67 Troon-affiliated properties featuring 87 golf courses on national and international “Top 100” rankings. Troon-affiliated properties include Belfair in Bluffton, South Carolina; Wickenburg Ranch Golf & Social Club in Wickenburg, Ariz.; Yocha Dehe Golf Club in Brooks, Calif.; Saadiyat Beach Golf Club in Abu Dhabi, UAE; and Buenaventura Golf Club in Panama. For additional news and information, visit www.Troon.com, or connect with Troon on Facebook, Twitter, Instagram, Google+, Blog, Press Room, or subscribe to TROON Magazine.